How Chat works in Kerika: a new tutorial video that shows how Kerika’s chat is the smarter alternative to email for distributed teams. We have added a keyboard shortcut to make it a little faster to send chat messages — on cards, canvases or the board itself. We recently discovered a rather quirky bug that was causing some chat, when replied to as emails by the recipient, to not get sent properly. If you are assigned a card, on a Task Board or Scrum Board, you will get email pushed to you whenever any other Team Member (or Board Admin) chats on that card. This helps you stay in the loop on the most important items on a project board: the ones you are currently assigned to do. When chat gets pushed to you as email, it shows up looking just like regular email, and you can reply to it wherever you are dealing with your email: your desktop, laptop or mobile device. 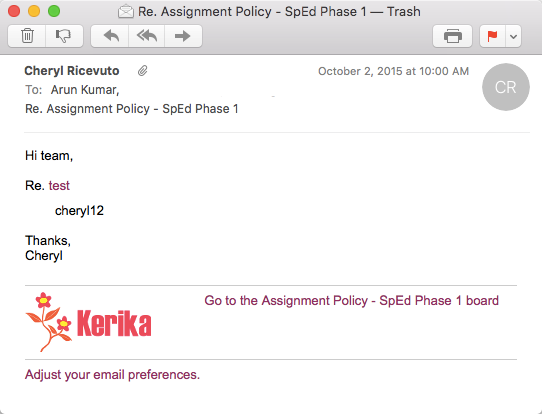 When you click on the “Reply” button in your email client, Kerika automatically changes the address for that reply to be the URL that points to the specific card (or canvas) that’s being referenced in the chat. This email is received by a server that listens only to chat replies. When a chat reply is received by the server, it checks to see who the reply came from. 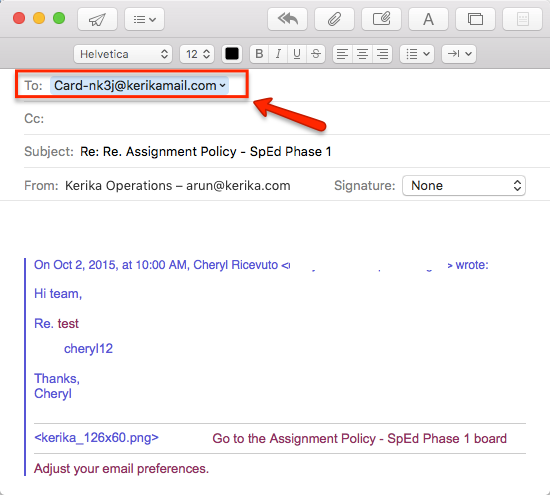 Since only Team Members and Board Admins are allowed to participate in the chat on a particular board, the Kerika chat server tries to make sure the email is coming from someone who is authorized to comment on that particular card or canvas. The problem we found is that some email clients, e.g. the native Mac Mail client, handled the “From:” and “Sender:” fields differently from other email clients like Gmail. In the case of Gmail, Google places fills in both the From and Sender fields, but in the case of Mac Mail, only the From field is filled in. For now, a temporary fix is to have the server look for both the From and Sender fields, but longer-term, as part of a server re-architecture that we are planning, this problem will get solved differently that further reduces the possibility of spam. When you are writing a chat message, on a card or canvas on any Kerika Task Board, Scrum Board or Whiteboard, what happens if you need to leave that message in the middle and go look at something else in Kerika? For example, suppose you are in the middle of writing a chat message, but in order to complete it, you need to go off and look at another card’s details, or maybe a file attached somewhere else on the board? You can leave aside a chat in mid-stream, go somewhere else in Kerika, return to the chat, and pick up where you left off! That’s because Kerika uses your browser’s local cache storage to keep your unsent message: it means your changes aren’t lost while you go look at something else in Kerika. When cards, or entire projects, were copied and pasted, the chat attached to them were not getting copied as well. That’s been fixed in our latest version. One side-effect of this to note, however: if you copy a card from Project A and paste it into Project B, the chat will be copied along with the card, and be resent to appropriate people in Project B. 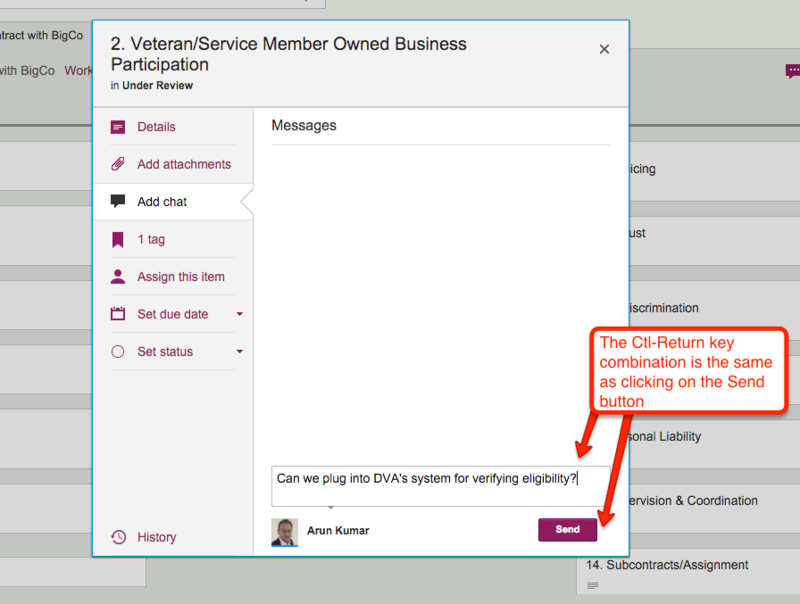 When you chat on a card, on any Task Board or Scrum Board (or on the canvas on a Whiteboard), the chat message gets sent to the right people as emails. And who are the “right people”? Well, anyone who is assigned to that card will get the chat sent as email, and Project Leaders can optionally get chat pushed to them as email as well. Everyone else can catch up with the chat when they visit their board. When chat messages get pushed to you as email, you can reply to them just like regular email (all you need to do is a simply “Reply”, not a “Reply All”). But, don’t go crazy with emoticons! Most smileys work OK, but not every emoticon will get encoded correctly (using UTF-8). So, it’s natural to be happy when you are using Kerika, and it’s OK to smile while you work, but don’t use too many strange emoticons in your email replies!